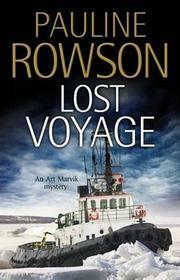 The death of a businessman triggers a probe into the long-ago disappearance of a salvage ship. Though he’s tough as only a marine commando can be, Art Marvik has a soft spot for Helen Shannon, a jill-of-all-trades he met when investigating her sister’s death (Silent Running, 2015). Now Helen’s restoring boats for Ian Bradshaw at Aquamarine Cleaning. Spooked by a conversation she overhears at the docks claiming “the target’s been taken out,” she calls her old pal. A worried Marvik accompanies Helen home and discovers Bradshaw’s body in her bedsit. The police put the crime down to fellow lodger Gavin Yardly, whose body is found at the bottom of a cliff, an apparent suicide. But Detective Chief Superintendent Crowder of the National Intelligence Marine Squad thinks there’s more to the story because he’d recently received a message from Yardly about the Mary Jo, a salvage tug that disappeared in 2003 on the way to Newfoundland to pull the S.S. Celeste back to port to be dismantled. Four crewmen were aboard the Mary Jo, and if the ship could be located, Crowder might discover their fates. Rowson launches Marvik and his pal Strathen (Dangerous Cargo, 2016, etc.) onto stormy seas, forcing them to navigate between ruthless killers who want to cover their tracks and equally unprincipled business owners who want to protect their assets, all the while keeping the increasingly restless Helen safe from danger. Rowson strikes a nice balance between thriller and puzzler in the third in the series.